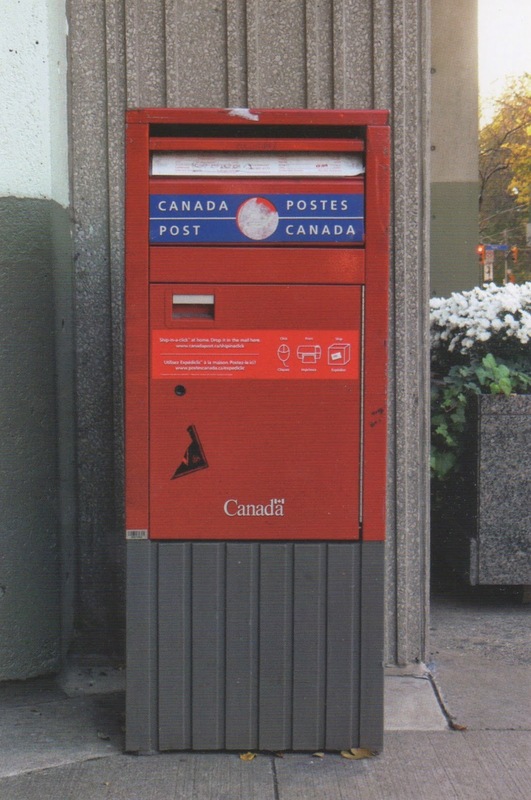 The first edition we produced as The Nothing Else Press is the Toronto version of the brilliant Picture Postcard Posted From Postbox Pictured series. 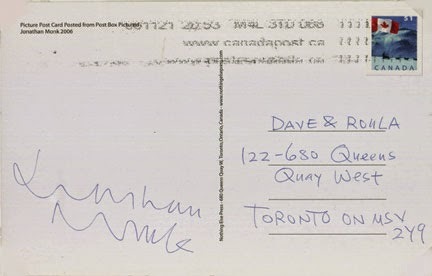 When a card is purchased we notify the artist, who signs and addresses the card from Berlin (ore more recently, Rome) and mails the postcard to us, in an envelope. We remove the envelope, affix postage and deliver the card to the buyer from the mailbox pictured on the front of the card. Which, incidentally, has since moved in the last 8 years and had to be tracked down a few blocks away. Available for purchase at the London Art Book Fair later this month, or from nothingelsepress@rogers.com. Jonathan Monk was born in Leicester in 1969 and lives and works in Berlin/Rome. He has a BFA from Leicester Polytechnic (1988) and an MFA from Glasgow School of Art (1991). Solo exhibitions include Centro De Arte Contemporáneo (CAC) Málaga (2013), Kunstraum Dornbirn, Austria (2013), Palais de Tokyo and Musee d’Art Moderne, Paris (2008), Kunstverein Hannover (2006), Institute of Contemporary Art, London (2005) and Museum Kunst Palast, Dusseldorf (2003). His work has been included in many group exhibitions, including Whitney Biennial (2006), the 50th and 53rd Venice Biennales (2003, 2009), Berlin Biennale (2001) and Taipei Biennial (2000). He was awarded the Prix du Quartier Des Bains, Geneva in 2012. Monk uses a wide range of media, including painting, installation, performance, photography and video. His practice engages with the notions of reproduction, copy and the multiple. Often revisiting seminal artworks from the 1960s and 70s, his work pays homage to Conceptual and Minimal art, at times with humorous irreverence, at others with poetic sentimentalism, incorporating autobiographical details alongside art historical references. By restaging these newly historicized works, Monk challenges the notions of authenticity, authorship and value that still inform many contemporary art practices despite the critical legacy of this conceptual tradition. Jonathan Monk is represented by Lisson Gallery, London, Galerie Yvon Lambert, Paris and New York, Meyer Riegger, Berlin and Karlsruhe, Galleria Sonia Rosso, Turin, Galleri Nicolai Wallner, Copenhagen, Casey Caplan Gallery, New York, Dvir Gallery, Tel Aviv and Christina Guerra Contemporary Art, Lisbon.